A systematic campaign by neo-fascist climate-denying BNP supporters seems to have achieved just what it wanted; the BNP campaigned against these ads and won. How very New Labour. A blatant attempt to brand anyone who questions climate science as being associated with racists, fascists and the BNP. ROFL! Like it or not, you ARE associated with them. But you have missed the main point of my piece – that there is reason to believe that the BNP-orchestrated campaign against these ads played a causal role in getting them done over by the ASA. Which ought to scare all of us. Who cares if the BNP campaigned against the ads? The ASA were the people who had to decide if the claim was right or wrong. Is there anything sinister about the ASA? The ASA have made a demonstrably dreadful decision here. And they made it under public pressure. From fascists. There is an appeals process. Use it. 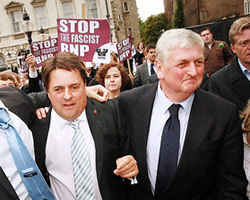 If the ASA has bent to unreasonable pressure form the BNP – then the public need to know. The first thing I did when I found out about this decision was write to the ASA in protest complaining and demanding clarification. Sadly, I have heard nothing back as yet. I think that it would be great if lots of people appealed. Thanks for posting the link here, Billy. As Rupert Read says, ‘End of.’ People in search of original thought or serious debate should steer clear of this website. Presumably, Rory, you place yourself in that category. In which case, Goodbye! We won’t expect to see you back, and will be disappointed / confused if you do comment further. We can do without such comments. Mr Read, you come across as very pompous and arrogant and will only turn people away with your manner. If you feel that the ASA genuinely have bent to pressure from the BNP then firstly take it up with them. I would be more than astounded if they have caved in to fascists. I suspect they simply viewed the ads and came to a reasoned judgement that you feel is incorrect. This Rupert Read guy should be thrown out of the Green Party forthwith. Who the hell does he think he is with these views? The Green Party just lost my family’s votes – the man is a disgrace and why this blog has anything to do with him is anyones guess. Well done to the BNP and their supporters. Nobody in the BNP denies that the climate is not changing. The climate is changing and its not man made, climate change is happening due to natural events and if you had read the report on the BNP site you would have found that out. But the BNP are climate fascists and everything the BNP says or does is evil. 67251: As I have already pointed out above, I HAVE taken this up with the ASA: they have not deigned to reply. When and if they do reply, you can be sure that I will point out what they have said, here. Free the Whale: The kind of person who determines how his whole family votes is not the kind of person who votes Green Party anyway… So, frankly, I don’t believe that we just LOST your vote through this post. And I can tell you: Greens are thoroughly annoyed and angry with the ASA for the appalling way they have acted here. ASA allows Électricité de France’s ‘Green Britain Day’ advert, Taxpayers’ Alliance’s exaggeration of ‘European Union cost to Britain’; but attacks Home Office’s Policing Pledge advert and Department of Energy and Climate Change’s scientific basis. A non-statutory self-regulatory body of private advertising vehicles (read: club) is now interfering with, even censoring, the Government’s communication with citizens. It takes upon itself as a semi-judicial tribunal to adjudicate in these matters, applying rules of evidence that it made up for itself. What is going on? We have Parliament and courts for this kind of things. This has constitutional and democratic implications. This is especially grave if the matter at hand is about national security (wartime propaganda) or public health (think AIDS, MMR, swine flu campaigns). ‘It has [not] been conclusively proven that MMR is safe and does not cause autism’: it can go either way, depending on the threshold of proof ASA sets up for itself. Now, recall several months ago, the Outdoor Advertising Association ran the Britainthinks.com with reactionary slogans. Sounds fishy. Do you know any investigative journalist who might want to have a go at this? In reply to Jan Novak: I am well-aware of the garbage – that has been comprehensively refuted over the past few years, by the climate science academic world – that the BNP are spouting, the nonsense about ‘sunspot cycles’ and so on. More importantly: It is interesting and depressing that the fact that you are a denier of manmade climate change makes you sympathetic to a fascist Party.